The earliest records of textiles come from the accidental impressions made in wet clay. 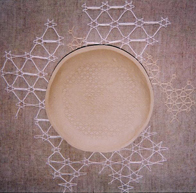 The bowl was deliberately impressed with bobbin lace in an uneven manner to reference these ancient accidental impressions that have told us so much about the development of cloth. The cloth on which it rests is embellished with fragmented areas of the same pattern, in varying scales. Much of the information that archaeologists have gathered about the way our prehistoric ancestors lived has come from fragments of broken pots, of many different sizes and qualities.